This past fall I couldn't resist buying a couple of 1 gallon Sedums for the garden after they had been discounted. I planted the two Sedum 'Autumn Joy' plants in the garden hoping they would still have enough time to establish themselves before winter hit. They became victims to family members who couldn't walk down the garden path and had to step over plants to get around to the side of the house. Then there was the large stray dog I found one early December morning laying on top of them and playfully pawing at them and digging them up. Two things went through my head when I saw the dog. One was the possibility that my garden was cursed and must have at one time been a sacred Native American burial site. The other was that maybe the ground cover Sedums I already had planted didn't welcome the new addition. I decided not to try to save the new plants and I just gathered the broken pieces and turned soil over on them. Winter arrived soon after and I completely forgot about the Sedums and their rough introduction to my garden. The other day I was out in the garden picking up trash and cutting down dead steams when I picked up a stem from a plant I didn't recognize. 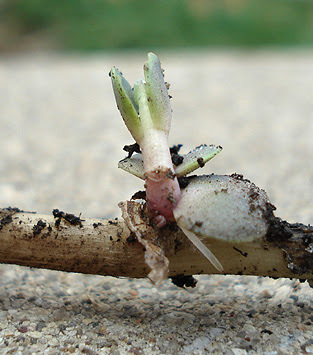 It was a long dead stem from an 'Autumn Joy' that had started to root a new plant. It survived being trampled the cold, snow, foot traffic and salt just long enough to send out a new plant in the first few warm days we had this Spring. I took the little pup and buried it in a new spot in the garden to give it a chance. It's incredible when plants propagate themselves. I bet the rest of the plant comes back from the roots too. I hope they're extra tough because we've just had a string of bad weather and a lot of the foliage around here is damaged by some cold snaps. We're being told we'll have snow here for two days in a row in the middle of the week.